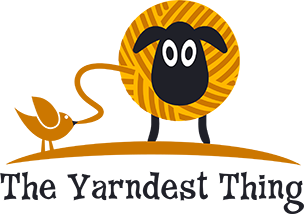 the yarndest thing: Celebrating my 2nd! In celebration of today's release of my newest design, I knit a 2nd sample. 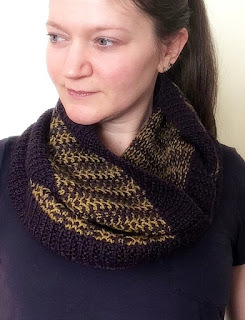 Here is the Yell Island Cowl worked in different yarns for fun! This has a very different feel than the magazine sample, but remains equally delightful with wondrous drape and seamless construction. The rich, golden baby alpaca accents the plum-like purple, merino wool/silk blend quite blissfully! My main focus for yarn choice was pairing 2 different fibers to add a luxurious feel without being too weighted or busy, allowing the stitch pattern to shine. You can see it in more detail here...(Please forgive my horrid camera and photography skills.) The simple 4 row patterning exudes both femininity and masculinity, making for a superb unisex accessory. It's also quite soothing to work once you get in your knitting groove! While this yarn combo isn't nearly as lofty as the Shibui variety shown in the publication, it's not heavy by any means. We'll call this the "full-bodied" version...like a mighty fine cup of coffee. ;) (and whatever else tickles your fancy.) Teehee! The photo of the back side here demonstrates how tidy color changes can be, as not to fear working with multiple colors on any project. I'm all about encouraging knitters to fearlessly attempt a new technique or method and broaden their skill set. 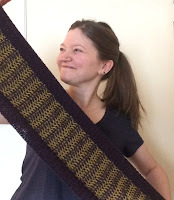 It unlocks a bunch of new knitting adventures you won't want to miss! Most times things seem much harder to execute than they truly are. I hope you'll give it a go! You can find the Yell Island Cowl pattern in Love of Knitting magazine's Winter 2017 issue among some other notable designs. I'm ogling over a few really beautiful pieces in this issue myself! I had an absolute blast putting this one together! Will post about the magazine shortly - stitch happy folks!